Carbon dioxide (CO2) is known as a greenhouse gas and plays an essential role in climate change; it is no wonder scientists have been looking for solutions to prevent its release in the environment. However, as a cheap, readily available and non-toxic carbon source, in the past few years there have been efforts to turn carbon dioxide into valuable wares, or 'value-added' products. For instance, carbon dioxide enables energy storage by reacting with hydrogen gas - called the hydrogenation process - transforming the mixture into higher energy liquid compounds such as methanol that can be easily transported and used as fuel for cars. Similarly, carbon dioxide hydrogenation in the presence of other chemicals can lead to the formation of various value-added products widely used in industry such as formic acid, formamides, or formaldehyde. These chemicals can also potentially be used for energy storage as, for example, heating formic acid under certain conditions allow for the release of hydrogen gas in a controlled and reversible fashion. Conversion of carbon dioxide into useful products is complicated by the fact that CO2 is the most oxidized form of carbon and as such a very stable and unreactive molecule. Therefore, the direct reaction of CO2 with hydrogen requires high energy, making the process economically unfavorable. This problem can be overcome using catalysts, which are compounds used in small amounts to accelerate chemicals reactions. For CO2 hydrogenation purposes, most known catalysts are based on precious metals such as iridium, rhodium or ruthenium. While excellent catalysts, the scarcity of these precious metals makes it difficult to use them at industrial scales. They are also hard to recycle and potentially toxic for the environment. Other catalysts use cheaper metals such as iron or cobalt but require a phosphorus-based molecule - called phosphine -surrounding the metal. Phosphines are not always stable around oxygen and sometimes burn violently in an air atmosphere, which presents another problem for the practical applications. To overcome these issues, the OIST Coordination Chemistry and Catalysis Unit led by Prof. Julia Khusnutdinova reported in ACS Catalysis novel and efficient catalysts based on an inexpensive and abundant metal: manganese. Manganese is the third most abundant metal in Earth's crust after titanium and iron, and presents much lower toxicity as compared to many other metals used in CO2 hydrogenation. The scientists initially looked for inspiration within the natural world: hydrogenation is a reaction that occurs in many organisms that would not have access to precious metals or phosphines. 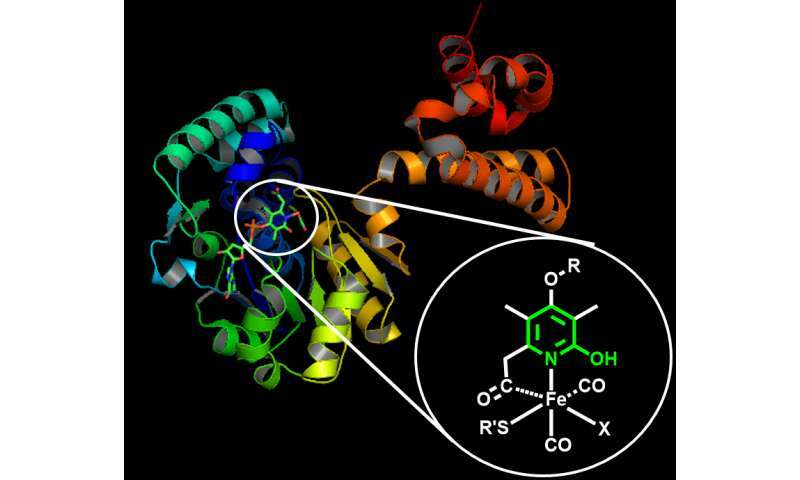 They observed the structure of specific enzymes – hydrogenases – to understand how they could accomplish hydrogenation using simple, Earth-abundant materials. To facilitate the hydrogenation, enzymes utilize a 'smart' arrangement where the surrounding organic framework cooperates with a metal atom – like iron- efficiently kick-starting the reaction. "After looking at hydrogenases, we wanted to check if we could make artificial molecules that mimics these enzymes using the same type of common materials, like iron and manganese," explained Dr. Abhishek Dubey, the first author of this study. The main challenge of this study was to build an adequate frame – called a ligand - around the manganese to induce the hydrogenation. The scientists came up with a surprisingly simple ligand structure resembling natural hydrogenase enzymes with a twist from typical phosphine catalysts. "In most cases, ligands support the metal without directly taking part in a chemical bond activation. In our case, we believe the ligand directly participates in the reaction," said Dr. Dubey. In ligand design, the structure of a ligand is tightly linked to its efficiency. 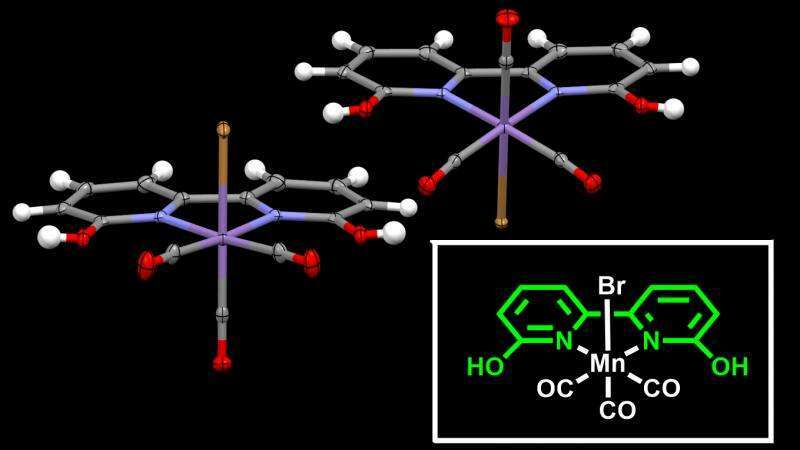 The new catalyst – the ligand and the manganese together - can perform more than 6,000 turnovers in a hydrogenation reaction, converting more than 6,000 times CO2 molecules before decaying. And this new ligand, the outcome of a collaboration with an international team including Prof. Carlo Nervi and Mr. Luca Nencini from University of Turin in Italy and Dr. Robert Fayzullin from Russia, is simple to manufacture and stable in the air. For now, the catalyst is able to transform carbon dioxide into formic acid, a widely-used food preservative and tanning agent, and formamide, which has industrial applications. But the versatility of this catalyst opens many other possibilities. "Our next goal is to utilize such structurally simple, inexpensive manganese catalysts to target other types of reactions in which CO2 and hydrogen can be converted into useful organic chemicals", concluded Prof. Khusnutdinova.